I’m a huge proponent of Back to Eden Gardening. 5) It doesn’t disturb, but rather helps to establish a natural ecosystem in regards to soil microorganisms, pH balance, beneficial insects, water retention/dispersion, etc. 7.) A ton of other reasons. So anyway, tomorrow is moving day so I’ve been doing a lot of work (for a giant pregnant lady) in the yard to prepare for the garden space. 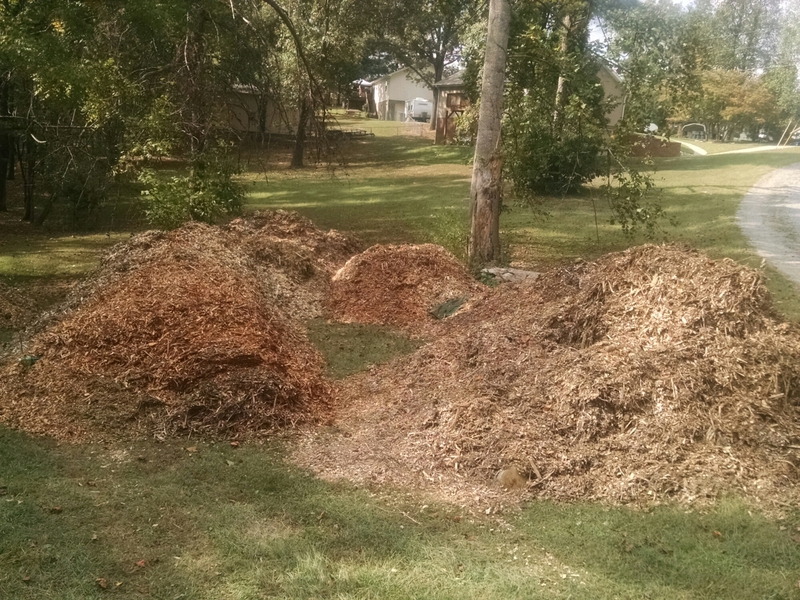 My first goal was to obtain woodchip mulch to use as a ground cover to prep the soil for spring planting. I happened upon a tree service cutting and chipping around electric lines near my neighborhood and it just so happens that our property is a super convenient location to dump chips! Yay! 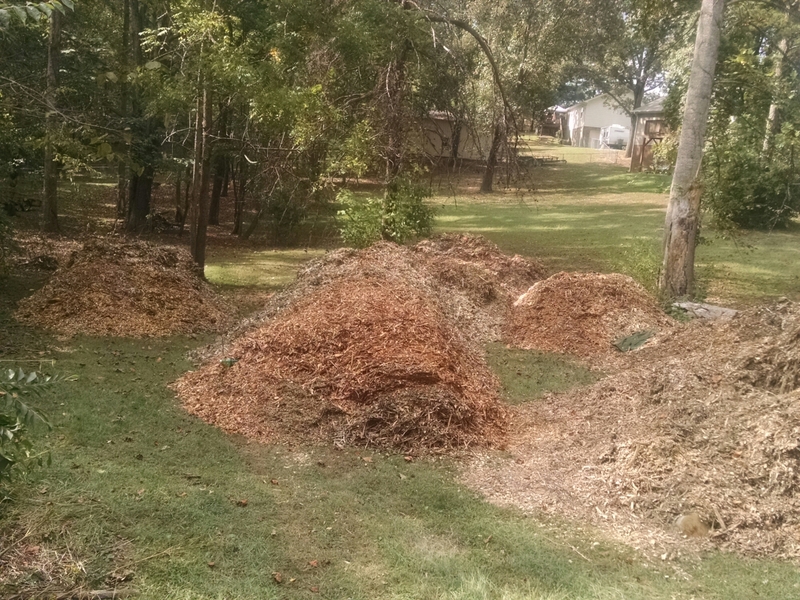 I asked if I could have their mulched trees and they said yes, and have given me every bit of what they had from the surrounding neighborhood! Each of those piles is at least about 5′ tall! And the smallest is 5′ in diameter. Which is great because in order to plant enough for my family to eat off the land all year, I’ll need about 1/2 an acre to 1 acre of dedicated garden space… That’s a LOT of chips. All for $free.ninety-free! Then I set about raking up what leaves had fallen to incorporate into one of the carbon-rich layers of the garden. Once we get all the area marked out and lay down the base layers, we’ll let it mature over the winter, and add our own compost (more nitrogen) on top of the mulch several weeks before planting. The rain will carry this goodness down through the mulch and layers to fertilize the soil and prepare it for germination. 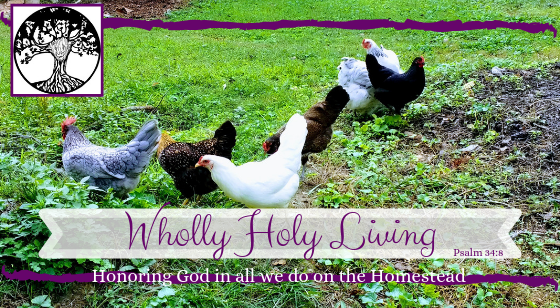 So we have a long way to go this year and a lot of work to do, but the idea behind it is to do the initial investment in manual labor and as the years go, less is required as the soil is naturally enriched so that as my husband and I age, we aren’t breaking our backs at age 60 trying to establish a good garden. More to come as we get things going!